Full text and image set is online and completely searchable. The information is first rate and written in a highly accessible style; especially when compared to today's complex technical texts on video technology. 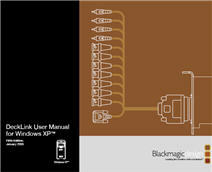 There are a vast number of images and descriptions of historic VCR/VTRs, plug diagrams, and hookup diagrams. 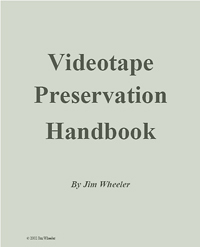 Jim Wheeler is one the great resources on magnetic media, retired from Ampex, he is still active on AMIA-L, preserving magnetic tape and with preservation initiatives. Edited by Hannah Frost, continually updated. 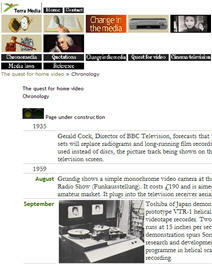 A key resource for the preservation of video with a wide variety of publications, links and resources. 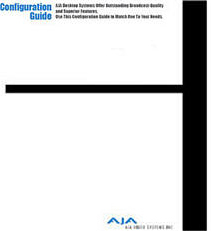 A valuable resource by one of the best know workers in the field (retired Ampex), with excellent editing (Stanford Univ. Preservation Librarian) making the information even more valuable . 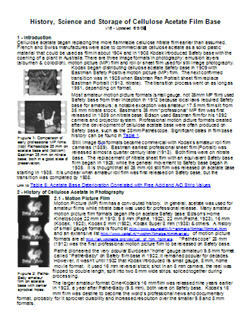 Includes information on video tape that uses cellulose acetate carrier as part of the tape. 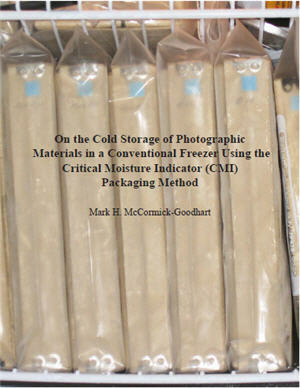 Cold storage is the preferred solution, but at temperatures above freezing (35-40°F and above) as opposed to film, where colder is better. The essay covers imaging technology over 5000 years: from polished stones through modern lenses; from light sensitive chemicals to acetate, nitrate and color film; includes discovering electricity through the first Fax, to analog video and digital still images. 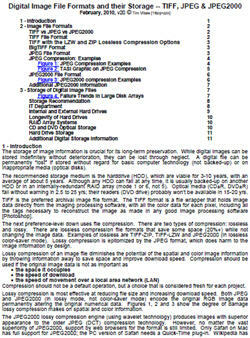 The preservation and storage of film and digital files is emphasized. The 5000-years-before-present (2009) time-line covers Lens History; Pre-Photography; Film Camera; B&W Photography; Color Photography; Digital Photography; Magnetic Media; Video Technology and Digital Printing Technolgy. 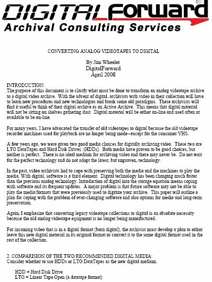 The essay also shows the development from video technology to modern high-end single frame technology with reasons for the various technological branches. 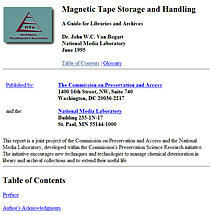 Dr. John W.C. Van Bogart (National Media Laboratory) June 1995; Published by Commission on Preservation and Access; online version at <www.clir.org>. A valuable resource by one of the prominent workers in the field. Extensive review and presentation of new work on the cold storage of cultural materials. The common recommenced range for working with all cultural material is 70°F +/- 10°F and 50% RH +/- 10% RH. 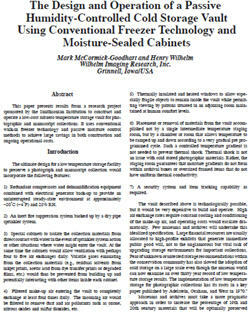 If possible, working with artifacts at lower temperatures and relative humidity is desirable. Daily storage on the shelf in an unconditioned room at 85°F and 60% RH will lower their lifetime to 25% of storage at recommended "use" conditions. Cold storage of the original videotape at recommended conditions will prolong its life by 2-8 times depending on its current state of preservation. However, at the end of this period (20-100 years), playback equipment probably won't be readily available. 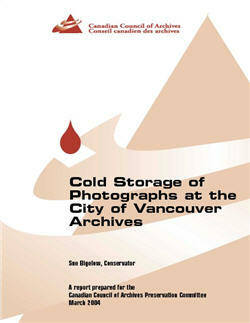 Unparalleled guide to cold storage in museums, libraries and archives. 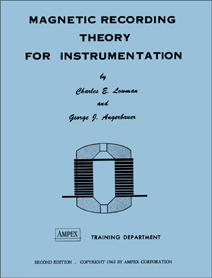 This is one of the essential early publications on the theory and application of magnetic and videotape recording. 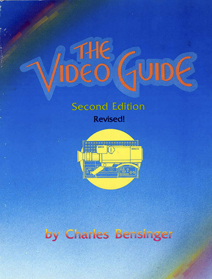 It is invaluable historic resource and is a must read for all interested in the history of video recording. 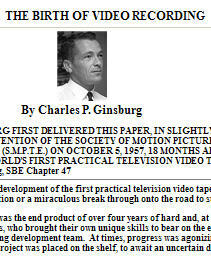 Charles P. Ginsburg first delivered this paper, in a slightly different form, at the 82nd convention of the Society of Motion Picture and Television Engineers (SMPTE) on October 5, 1957, 18 months after Ampex demonstrated the world's first practical television videotape recorder; transcribed by Jerry Burling, SBE, Chapter 47. IVC's world headquarters building used to be at: 675 Almanor Avenue Sunnyvale, California. International Video Corporation flourished from about 1967 well into the late 1980s. 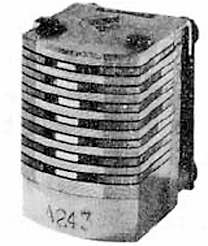 IVC manufactured dozens of models of VTR's, cameras, film chains, switchers and other video equipment for the low end broadcast and high end industrial markets. They sold equipment into virtually every country in the world. 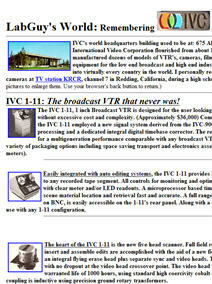 I personally remember seeing the IVC color cameras at TV station KRCR, Channel 7 in Redding, California. Ochi's first 64 pixel CCD, 1972, displaying an "S" for Sony; image from Sony History URL. A general history of the Sony Corp., but with several very interesting entries on VTRs such as Sony's first experimental 2" VTR about 1958-59 and the first transistorized VTR PV-100 in 1959.
located on the <bbc.co.uk> website, along with BBC News' "The Rise and Rise of the Video"
Puts Magnetophone (1936-7 Germany) BBC VERA (2" wide steel tape on 21" reels moving at 200 ips) and Ampex VR-1000 (2" plastic magnetic tape at 100 ips) in context, by one of the players in early video history. This is a discrete section on Video Technology of the the larger Terre Media Chronomedia of technology from 1200 to the present. The chronology appears to skip the development of photographic equipment such as lenses, cameras and imaging media such as film and CCDs. within their large chronology of technology. This interesting email is on audio deck alignment, linear recording tracks, but has generic application to VTR use. 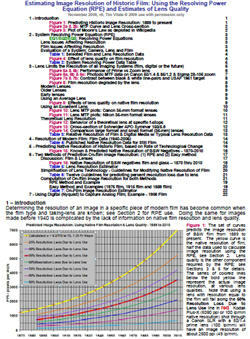 Determining the resolution of an image in a specific piece of modern film has become common when the film type and taking-lens are known. 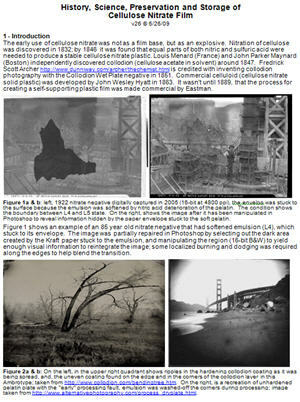 Doing the same for images made before 1940 is complicated by the lack of information on native film resoution and lens quality. An estimate is provided. 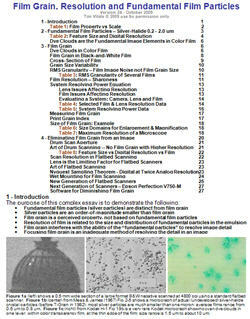 Review of film grain and fundimental particles in film. The effects of film grain and fundimantal image particles on image noise, resolution and digital scanning. Companion to the History, Science and Storage of Cellulose Acetate Film Base above. Cellulose nitrate was unlikely used in magnetic media except for experimental materials in the early days of developing tape carriers. Cellulose nitrate base will degrade in a minimum of 50-60 years, but has now been predicted to last up 500 years. 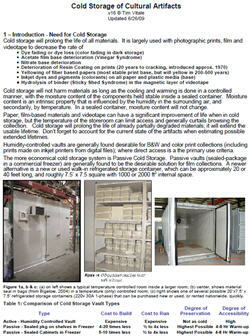 Cold storage is the only tool to halt deterioration. Prepared by Media Matters, LLC (SAMMA) for the Dance Heritage Coalition. Presented to The Andrew W. Mellon Foundation, June 2004. This is a valuable resource. Jim Lindner (Media Matters) address many issues including the cost of storage on data tape; the value of lossless compression; the damage of lossy compression; and the evaluation of video codecs based on both user viewing evaluations and the Genista’s Media Optimacy (Tokyo) technical metrics. "A chief goal of this report was to endorse a specific file format and codec to use for the preservation of dance material. Regarding file format, the Material Exchange Format (MXF) container format is recommended." Valuable essay on moving from traditional migration procedures to automated procedures. Especially valuable is the section on cleaning videotape. "Current cleaning machines are blunt and simple: they clean forward, and they clean backwards. In an attempt to reduce the potential for further damage, traditional migration companies pay a person to watch the cleaning tissue in the cleaning machine all day." 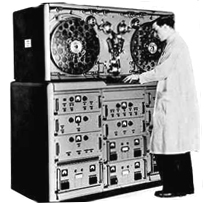 A very useful essay on the use and advantage of using hard drives (HDD) and data tape (LTO) for the storage of digitized analog video files. 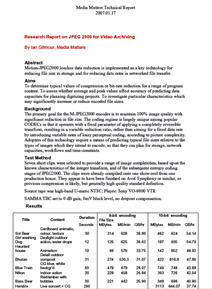 Abstract: Motion-JPEG2000 lossless data reduction is implemented as a key technology for reducing file size in storage and for reducing data rates in networked file transfer. Specific quotes (8-bit vs 10-bit) " The 10-bit files were 47% to 58% larger than the 8-bit files, rather than the 25% increase which simple math would predict." 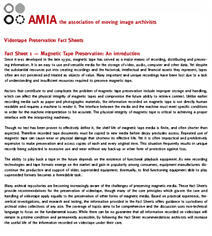 and (Conclusions) "The range of image content in this preliminary study of lossless JPEG encoding has provided valuable data on file sizes which generally accords well with theoretical predictions..."
Media Matters LLC (SAMMA) white paper: by Gilad L. Rosner, Systems Integrator Steve Kwartek, Media Consultant, 2004. A valuable modern resource describing the downsides of traditional migration procedures and costs. " Using traditional methods, videotape migration can cost between $250 and $400 per media hour. Tape migration takes place at specialized facilities, requiring off-site shipment of collections, further raising the cost. Shipping tapes carries its own dangers, including loss, theft, and damage." The need for lower cost procedures are emphasized. 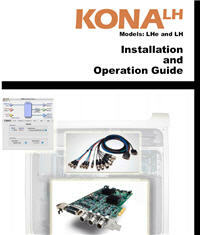 Video capture card Installation and Operations Guide; for Mac systems. 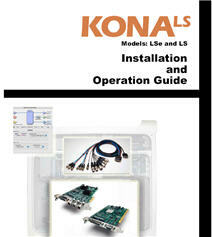 Video capture card Installation and Operations Guide; for PC systems. 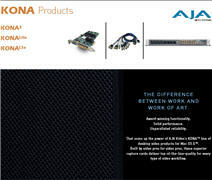 Video capture using an external ADC device can be used with both Mac and PC systems. 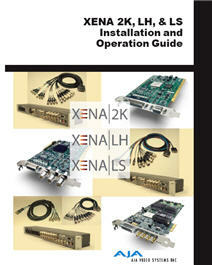 Installation and Operation Guide for video capture using an external ADC device. System overview for video capture using an internal PCI card. 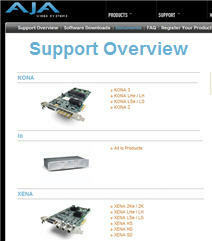 For all Mac video capture systems: Kona 2, LH LS; Io, Io La and Io LD; Kona SD and HD. 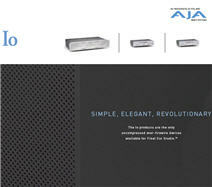 Many support documents for specific products along with software tools for determining suitability of existing computers and the speed of internal HDs and external RAID HD arrays. In addition there are calculators to determine file size based on bit depth, frame size and format; along with codec translators and much more. 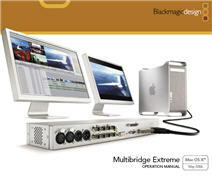 Operation Manual for the Multibridge Extreme external ADC video capture device; can be used with both Mac and PC platforms. 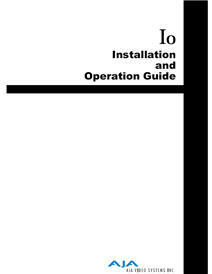 Operation Manual for DeckLink system video capture card, which includes the Pro, SP and Extreme versions, internal PCI capture card; can be used with both Mac and PC platforms. 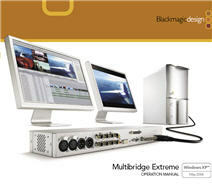 Blackmagic Design is is one of the manufacturers of video capture card and external ADC devices. In the following link their support page has been set-up for DeckLink Extreme. 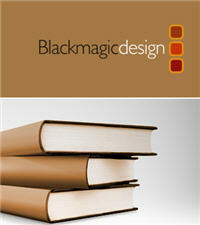 The library has hundreds of document that will help with designing a system and facilitate purchase of components.